Attempting to burn its way into the hobby rotation, 2016 Panini Phoenix Football emerges for collectors as a mid-level release. 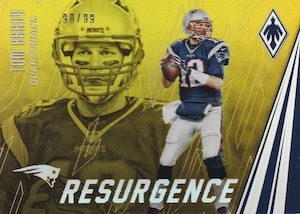 The new NFL brand from Panini includes three total hits per box. Highlighting both veteran players and incoming rookies, the base design consists of a player image and active background. Parallels for the main set include Red, Pink, Orange (#/99), Yellow (#/25), Green (#/10), Blue (1/1) and Printing Plates (1/1). 2016 Panini Phoenix Football offers multiple signed cards with relic additions. The majority of these feature rookies via options like RPS Rookie Auto Jersey (#/249 or #/99), which also comes with Patch (#/49 or #/10) and Prime (1/1) memorabilia pieces. Switching the design layout to horizontal, Hot Rookie Material Signature inserts include Glove, Helmet, Helmet Logos and Nike Swoosh parallels. Containing multiple rookies players, Dual and Triple Patch Autographs pair notable first-year combos on a single card. 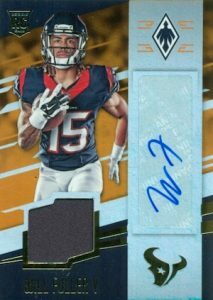 While the autographs in 2016 Panini Phoenix Football concentrate mostly on the new class of budding talent, Veteran Autograph Materials works with the seasoned stars of the league. Looking further back, Retired Patches celebrate all-time greats with a quality relic and there are even Super Prime (1/1) parallels. 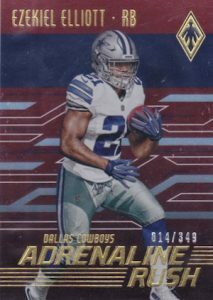 Among the standard inserts in 2016 Panini Phoenix Football, Adrenaline Rush documents 30 of the greatest running backs in NFL history. PARALLEL CARDS: Red, Pink, Pink Rookies #/299, Orange #/99, Yellow #/25, Green #/10, Blue 1/1, Printing Plates 1/1. PARALLEL CARDS: Orange #/99 or less, Yellow Prime #/49 or less, Green Prime #/10 or #/5, Blue Super Prime 1/1, Laundry Tag Brand Logos 1/1, Laundry Tag NFL Players Logo 1/1, Laundry Tag NFL Shield 1/1 (*No card #11). PARALLEL CARDS: Red #/349, Orange #/299, Yellow #/99, Green #/10, Blue 1/1. PARALLEL CARDS: Gloves #/99 or less, Helmet #/49 or less, Helmet Logo #/5 or less (*No card #6), NFL Shield 1/1, Nike Swoosh 1/1, Team Logo 1/1 (*No cards #1, 5, 7, 15), Vapor Jet 1/1. PARALLEL CARDS: Red #/399, Orange #/249, Yellow #/99, Green #/10, Blue 1/1. 40 cards. Serial Numbered #/79. 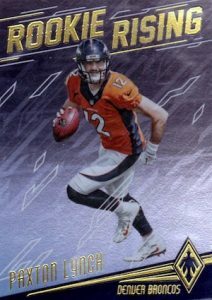 JUMBO PARALLEL CARDS: Jumbo Base #/79, Orange #/49, Prime Yellow #/25, Prime Green #/10, Super Prime Blue 1/1. PARALLEL CARDS: Orange #/99 or less, Yellow Prime #/25 or less, Green Prime #/5, Blue Super Prime 1/1 (*No cards #9, 12, 31, 35, 36), Brand Logo 1/1, Laundry Tag 1/1. PARALLEL CARDS: Red #/399, Orange #/299, Yellow #/99, Green #/10, Blue 1/1. PARALLEL CARDS: Orange #/25, Prime Yellow #/10, Prime Green #/5, Prime Blue 1/1. Daniel Wetherhold � We include only what is stated in the solicitation so as not to give bad information. Based on the mock-up images, they appear to be sticker autographs but that is not confirmed. I’ll make it easy for you Daniel. Only the ultra expensive product Panini makes has on card autos. Every other crappy release, from expensive to super cheap has stickers. Let’s give a round of applause to Panini for ruining our hobby! Busted one hobby pack from my card shop today but for $11 all I got was a Vernon Hargreaves III RC Rookie Rising #’d /349. You win some you lose some. I’m still going to try another pack or two for the heck of it who knows you get 3 hits a box. Now Trey my question is what’s with the different unnumbered paralleled cards in the set?? I got a Sanchez pink, Sanders red, Brady silver & Dodd (RC) silver?? Are these multipliers?? Which is the true original for the set to collect?? Any info you have thanks buddy. Matt Marciano � I believe the silver is the base. Not sure why there are multiple parallels without a listed print run. I bought a pack today & pulled a yellow Witten #’D 17/25 & a Devonta Freeman 2 color patch auto #’D 05/20. I got my moneys worth, which is rare with Panini. Got a box from a place in the mall here in town pulled a Tom Brady 1 of 1 Reebok logoman, Tyler Boyd RC Jersey/Auto to 99, and a Wendell Mitchell RC Jumbo Jersey/Auto to 199. Anybody have any clue on the Brady value in this set? I have seen a case opened on youtube, as well as opened 2 boxes of my own. Good value for the money. Nice shine on the cards with a slightly lower price point. Worth 4 stars; lots of numbered cards to chase.